James Murdoch has been re-elected as BSkyB chairman at today's annual general meeting of Sky shareholders, securing 81.2% of the votes cast. Murdoch, who is chairman and chief executive of News Corporation International and deputy chief operating officer of News Corporation, is a former chief executive of Sky and was appointed chairman in 2007. At the AGM of Sky shareholders this morning (29 November) at The Queen Elizabeth II Conference Centre in Westminster, 81.24% of the votes cast (1.1 billion votes) were in favour of Murdoch continuing as chairman, with 18.76% of votes cast (255 million votes) against. Murdoch has come under increasing pressure following the handling of the hacking scandal at the News Corporation-owned Sunday newspaper, the now-defunct News of the World, and a number of Sky shareholders have called for him to step down. Following the scandal and mounting opposition to News Corporation’s attempt to buy the 60.9% of Sky it does not already own, News Corp pulled out of its bid in July. When the 105 million votes withheld are taken into account, James Murdoch received the support of 75.4% of shareholders, versus 17.4% who were opposed and 7.2% who withheld. If the votes cast by News Corporation are excluded, Murdoch received the support of 55.7% of independent shareholders, against 31.4% who opposed and 12.9% who withheld. Among the investors who voted against Murdoch's re-election was fund manager Standard Life Investments, which manages more than six million shares in Sky and has been an investor in the company for many years. In September, Standard Life Investments wrote to Nicholas Ferguson, deputy chairman and senior independent non-executive director, to express concern about Murdoch remaining chairman of the board. Standard Life Investments said in its letter it believed the "unsuccessful bid approach from News Corporation magnified the conflicts of interest which the independent non-executive directors have to deal with, and it is inappropriate that Sky's board is led by a representative of its largest shareholder and putative offeror". Today, Guy Jubb, head of governance and stewardship at Standard Life Investments, said: "Nothing has changed to cause us to change our view." More than 30 protesters from campaigning group Avaaz gathered outside of the AGM today. Ricken Patel, executive director of Avaaz, said that 40% of independent shareholders' votes against Murdoch’s re-election marked a "significant blow". Patel said: "The horror stories of hacking are catching up with the Murdoch mafia, with 75% of BSkyB subscribers and a growing chunk of shareholders wanting to clean up the leadership at BSkyB. 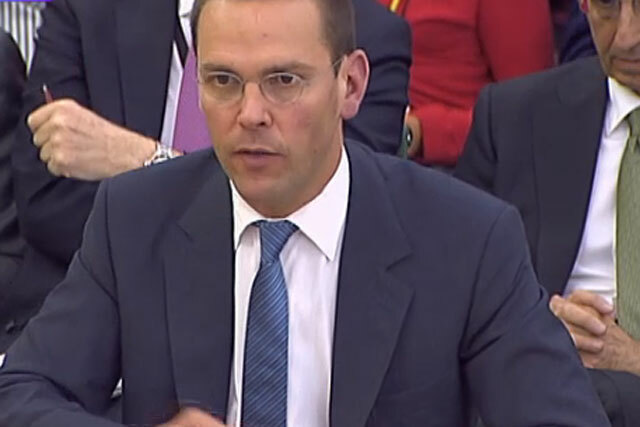 We hope today signals the beginning of the end of James Murdoch's reign, and a step forward for democracy, accountability and corporate governance." Following the result, Ferguson said: "The board recognises that there have been contrasting views among shareholders on the question of the chairmanship. All shareholders have now had the opportunity to vote and we have a conclusive result. "A clear majority, including a majority of independent shareholders, have voted for James Murdoch to continue in his role. The entire BSkyB Board is now determined to move forward to maintain BSkyB's strong performance, grow its positive contribution to UK life, and create value for all shareholders." Last month, a majority of independent News Corp shareholders voted against James Murdoch's re-election to the News Corp board, although he was still elected because the majority of shares (69.5%) have no voting rights (Class A shares).